Kinda surprised by the results ... thought it will be the other way round ... haha ... as in more people will own like 500+ mangas XD. Here's some updates on my recently purchased Seven Seas Strawberry Line mangas and others from Kinokuniya in Takashimaya. 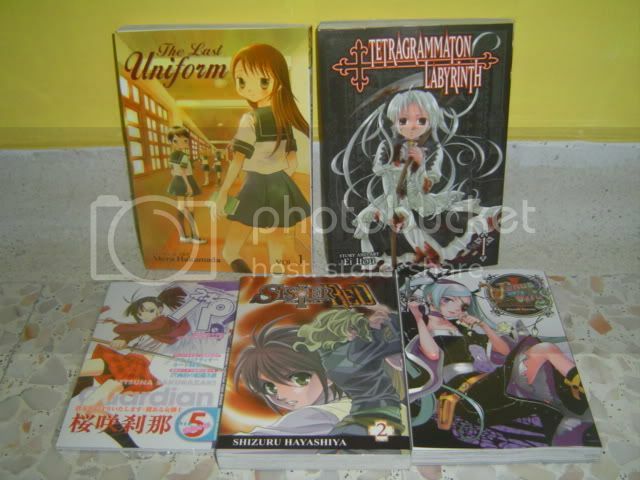 From Top Left to Right - The Last Uniform aka Saigo no Seifu #1, Tetragrammaton Labyrinth #1. From Bottom Left to Right - Magister Negi Magi Offical Fanbook, Sakurazaki Setsuna #5, Sister Red #2, Venus Versus Virus #1. I think I spurted my water when I read that ... for those who read Tetragrammaton Labyrinth they will agree with me that there's totally nothing humourous about the story ... -.-||| haha. Quite pleased with the translation by Seven Seas, except for Venus Versus Virus #1, on the back cover, they added an extra 'A' on Nahashi Lucia's name. Maybe I'm just the 'details' kinda girl hahaha. Updates on Angelbox's Strawberry Panic Doujinshi - Ichigo no Tsubomi, good news, I'm halfway through and highly possible that I'll be done by end of this month XD. to anonymous5 who requested to translate the ShizNat doujinshi from yamibo, well I think I can try translating it. Some words are pretty small though ... but I'll try my best. PS: Singaporeans, please vote in the new blog poll XD. Wow, you really got money sia. Kino has a lot of imports, but they are all so expensive! Secchan looks really cool though. to Volk83, XD pleased to know your nick instead of calling you anonymous5 haha. to mooo-off!, nah, I'm just a good saver ... well not like I had choices ... if only I get my credit card soon ... heh then I can import directly from the publishers themselves ... !!! I'll be probably on a spending spee XD. to anonymous, get it now, it's out XD! to Zefi, wellll.. there's some very cool pages of Setsuna in combat action from the manga ... and the scene she saved Kono-chan ... and also the cosplaying chapter where she was dressed up as a warrior and Konoka as a maiden ... that particular picture was ... sweet XD. There's also the top five scenes of KonoSetsu, 1st is the scene where first showed Konoka her wings ... and Konoka said it looked like an angel. 2nd place, is a naked scene lol but that's not really Konoka herself but one of the bubble spirits. 3rd place, the extract where Konoka asked if there's any other way besides kissing to pactio and Konoka said she's fine with it but Secchan's not lol. 4th place, the 'make you older' pills, Konoka took a pill and became a 18yr version of herself and of course her figure ... was a 18yr old too XD. 5th place is Konoka lying her head against Secchan's shoulders ... XD.